a hereditary dermatosis characterized by flat wartlike papules on the dorsal aspect of the hand, foot, elbow, and knee. a skin disorder characterized by the appearance of flat wartlike lesions on the dorsum of the hands and feet and occasionally on the wrists, forearms, and knees. It is an inherited disease, transmitted as a dominant trait. An autosomal dominant MIM101900 condition characterised by warty hyperkeratotic papules, which has features of Darier-White disease. Hereditary disease of the skin characterized by warty growths on the extremities, principally on the backs of the hands and on the feet. Acrokeratosis verruciformis of Hopf associated with dilated cardiomyopathy. 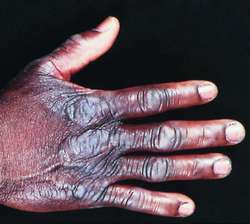 Acrokeratosis verruciformis of Hopf is caused by mutation in ATP2A2: evidence that it is allelic to Darier's disease. Piskin S, Saygin A, Doganay L et al: Coexistence of Darier's disease and acrokeratosis verruciformis of Hopf. Dhitavat J, Macfarlane S, Dode L et al: Acrokeratosis verruciformis of Hopf is caused by mutation in ATP2A2: evidence that it is allelic to Darier's disease. Rallis E, Economidi A, Papadakis P et al: Acrokeratosis verruciformis of Hopf (Hopf's disease): case report and review of the literature. Rallis E, Economidi A, Papadakis P, Verros C: Acrokeratosis verruciformis of Hopf (Hopf disease): case report and review of the literature. Wang PG, Gao M, Lin GS, Yang S, Lin D, Liang YH, Zhang GL, Zhu YG, Cui Y, Zhang KY, Huang W, Zhang XJ: Genetic heterogeneity in acrokeratosis verruciformis of Hopf. Farro P, Zalaudek I, Ferrara G, Fulgione E, Cicale L, Petrillo G, Zanchini R, Ruocco E, Argenziano G: Unusual association between acrokeratosis verruciformis of Hopf and multiple keratoacanthomas.